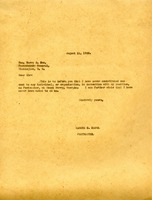 Arthur C. Lueder answers The Berry Schools' letter about Charles E. Bartley's address. He says that he is not at the address they mentioned, and there is no forwarding direction. The current directory lists someone with the same name living at 5045 Drexel Blvd., but the Postmaster cannot verify it is the person for whom they are looking. 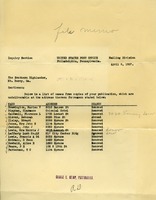 Letter to the Honorable Harry S. New, Postmaster General of Washington D. C. from Marcus G. Keown, Postmaster, informing him that he has never contributed money to any individual or organization in connection with his position as Post Master at Mt. Berry, Ga. He also states that he has also never been asked to.